References m_bBlockModifySignal, m_btApply, m_btClose, m_lbAttributes, m_listStyles, m_pAbiPreviewWidget, m_pCharPreviewWidget, m_pParaPreviewWidget, m_rbList1, m_rbList2, m_rbList3, m_tvStyles, m_wBasedOnCombo, m_wBasedOnEntry, m_wCharPreviewArea, m_wFollowingCombo, m_wFollowingEntry, m_wFormatMenu, m_wGnomeButtons, m_windowMain, m_wLabDescription, m_wModifyCancel, m_wModifyDialog, m_wModifyDrawingArea, m_wModifyOk, m_wModifyShortCutKey, m_wParaPreviewArea, m_wStyleNameEntry, m_wStyleTypeCombo, and m_wStyleTypeEntry. References DELETEP, m_pAbiPreviewWidget, m_pCharPreviewWidget, and m_pParaPreviewWidget. References m_wBasedOnEntry, m_wDeletePropButton, m_wFollowingEntry, m_wFormatMenu, m_wModifyDrawingArea, m_wStyleNameEntry, m_wStyleTypeEntry, s_basedon(), s_followedby(), s_modify_format_cb(), s_modifyPreview_draw(), s_remove_property(), s_style_name(), and s_styletype(). References m_btApply, m_btClose, m_btDelete, m_btModify, m_btNew, m_rbList1, m_rbList2, m_rbList3, s_applybtn_clicked(), s_closebtn_clicked(), s_deletebtn_clicked(), s_modifybtn_clicked(), s_newbtn_clicked(), and s_typeslist_changed(). References XAP_App::getStringSet(), XAP_StringSet::getValueUTF8(), XAP_Dialog::m_pApp, and s.
References abiAddButton(), XAP_App::getStringSet(), XAP_StringSet::getValue(), XAP_StringSet::getValueUTF8(), XAP_Dialog::m_pApp, m_wModifyCancel, m_wModifyDialog, m_wModifyOk, and m_wModifyShortCutKey. References _connectModifySignals(), _constructGnomeModifyButtons(), _constructModifyDialogContents(), abiDialogNew(), XAP_App::getStringSet(), XAP_StringSet::getValueUTF8(), isNew(), XAP_Dialog::m_pApp, and m_wModifyDialog. References _constructFormatList(), XAP_App::getStringSet(), XAP_StringSet::getValueUTF8(), isNew(), XAP_Dialog::m_pApp, m_wBasedOnCombo, m_wBasedOnEntry, m_wDeletePropButton, m_wDeletePropCombo, m_wDeletePropEntry, m_wFollowingCombo, m_wFollowingEntry, m_wFormatMenu, m_wLabDescription, m_wModifyDrawingArea, m_wStyleNameEntry, m_wStyleTypeCombo, m_wStyleTypeEntry, and s.
References _connectSignals(), XAP_App::getStringSet(), XAP_StringSet::getValueUTF8(), localizeButton(), localizeLabelMarkup(), m_btApply, m_btClose, m_btDelete, m_btModify, m_btNew, m_lbAttributes, XAP_Dialog::m_pApp, m_rbList1, m_rbList2, m_rbList3, m_tvStyles, m_wCharPreviewArea, m_wParaPreviewArea, newDialogBuilder(), and s.
References ALL_STYLES, DELETEP, PD_Document::enumStyles(), gchar, AP_Dialog_Styles::getDoc(), PD_Style::getName(), UT_GenericVector< T >::getNthItem(), PD_Document::getStyleCount(), PD_Style::isUsed(), PD_Style::isUserDefined(), m_listStyles, m_sNewStyleName, m_tvStyles, m_whichType, pt_PieceTable::s_getLocalisedStyleName(), s_tvStyles_selection_changed(), USED_STYLES, USER_STYLES, and xxx_UT_DEBUGMSG. Referenced by _populateWindowData(), and event_NewClicked(). References DELETEP, PD_Document::enumStyles(), event_basedOn(), event_followedBy(), event_styleType(), AP_Dialog_Styles::fillVecFromCurrentPoint(), AP_Dialog_Styles::fillVecWithProps(), PD_Style::getBasedOn(), getCurrentStyle(), AP_Dialog_Styles::getDoc(), PD_Style::getFollowedBy(), UT_GenericVector< T >::getItemCount(), PD_Style::getName(), UT_GenericVector< T >::getNthItem(), XAP_App::getStringSet(), PD_Document::getStyle(), XAP_StringSet::getValue(), XAP_StringSet::getValueUTF8(), isNew(), AP_Dialog_Styles::m_answer, AP_Dialog_Styles::m_curStyleDesc, m_gbasedOnStyles, m_gfollowedByStyles, m_gStyleType, XAP_Dialog::m_pApp, AP_Dialog_Styles::m_vecAllAttribs, m_wBasedOnCombo, m_wBasedOnEntry, m_wDeletePropEntry, m_wFollowingCombo, m_wFollowingEntry, m_wStyleNameEntry, m_wStyleTypeCombo, m_wStyleTypeEntry, messageBoxOK(), PP_getAttribute(), PT_TYPE_ATTRIBUTE_NAME, rebuildDeleteProps(), s, pt_PieceTable::s_getLocalisedStyleName(), setComboContent(), setModifyDescription(), and setModifySignalBlocked(). Referenced by event_DeleteClicked(), event_ListClicked(), and runModal(). References gchar, getCurrentStyle(), AP_Dialog_Styles::getView(), AP_Dialog_Styles::m_answer, and FV_View::setStyle(). Referenced by runModal(), and s_applybtn_clicked(). References gchar, getBasedonName(), XAP_App::getStringSet(), XAP_StringSet::getValue(), m_basedonName, XAP_Dialog::m_pApp, AP_Dialog_Styles::m_vecAllAttribs, m_wBasedOnEntry, PP_addOrSetAttribute(), pt_PieceTable::s_getUnlocalisedStyleName(), and AP_Dialog_Styles::updateCurrentStyle(). Referenced by _populateModify(), and s_basedon(). Referenced by runModal(), and s_closebtn_clicked(). References _populateWindowData(), gchar, AP_Dialog_Styles::getDoc(), AP_Dialog_Styles::getFrame(), XAP_App::getStringSet(), XAP_StringSet::getValueUTF8(), XAP_Dialog::m_pApp, m_selectedStyle, m_sNewStyleName, m_tvStyles, PD_SIGNAL_UPDATE_LAYOUT, XAP_Frame::repopulateCombos(), s, XAP_Frame::showMessageBox(), PD_Document::signalListeners(), style, and UT_DEBUGMSG. References gchar, getFollowedbyName(), XAP_App::getStringSet(), XAP_StringSet::getValue(), m_followedbyName, XAP_Dialog::m_pApp, AP_Dialog_Styles::m_vecAllAttribs, m_wFollowingEntry, PP_addOrSetAttribute(), and pt_PieceTable::s_getUnlocalisedStyleName(). Referenced by _populateModify(), and s_followedby(). References _populateWindowData(), XAP_App::getStringSet(), XAP_StringSet::getValueUTF8(), XAP_Dialog::m_pApp, m_whichType, and s.
References AP_Dialog_Styles::getFrame(), XAP_App::getStringSet(), XAP_StringSet::getValueUTF8(), AP_Dialog_Styles::m_answer, XAP_Dialog::m_pApp, m_wStyleNameEntry, s, XAP_Frame::showMessageBox(), and text. 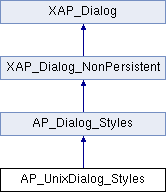 References AP_Dialog_Styles::a_OK, XAP_Dialog_MessageBox::a_OK, AP_Dialog_Styles::applyModifiedStyleToDoc(), XAP_Dialog_MessageBox::b_O, gchar, getCurrentStyle(), AP_Dialog_Styles::getDoc(), AP_Dialog_Styles::getFrame(), XAP_App::getStringSet(), PD_Document::getStyle(), XAP_StringSet::getValueUTF8(), PD_Style::isUserDefined(), AP_Dialog_Styles::m_answer, XAP_Dialog::m_pApp, m_sNewStyleName, m_windowMain, modifyRunModal(), PD_SIGNAL_UPDATE_LAYOUT, s, setIsNew(), XAP_Frame::showMessageBox(), PD_Document::signalListeners(), and PD_Document::updateDocForStyleChange(). References m_wModifyDialog, AP_Dialog_Styles::ModifyFont(), rebuildDeleteProps(), and AP_Dialog_Styles::updateCurrentStyle(). References m_wModifyDialog, AP_Dialog_Styles::ModifyLang(), rebuildDeleteProps(), and AP_Dialog_Styles::updateCurrentStyle(). References m_wModifyDialog, AP_Dialog_Styles::ModifyLists(), rebuildDeleteProps(), and AP_Dialog_Styles::updateCurrentStyle(). References m_wModifyDialog, AP_Dialog_Styles::ModifyParagraph(), rebuildDeleteProps(), and AP_Dialog_Styles::updateCurrentStyle(). References m_wModifyDialog, AP_Dialog_Styles::ModifyTabs(), rebuildDeleteProps(), and AP_Dialog_Styles::updateCurrentStyle(). References _populateCList(), AP_Dialog_Styles::a_OK, AP_Dialog_Styles::createNewStyle(), getNewStyleName(), AP_Dialog_Styles::m_answer, m_sNewStyleName, modifyRunModal(), and setIsNew(). References gchar, AP_Dialog_Styles::m_vecAllProps, m_wDeletePropEntry, PP_removeAttribute(), rebuildDeleteProps(), and AP_Dialog_Styles::updateCurrentStyle(). References gchar, XAP_App::getStringSet(), XAP_StringSet::getValueUTF8(), XAP_Dialog::m_pApp, m_styleType, AP_Dialog_Styles::m_vecAllAttribs, m_wStyleTypeEntry, PP_addOrSetAttribute(), and s.
Referenced by _populateModify(), and s_styletype(). References gchar, m_selectedStyle, m_tvStyles, style, and UT_ASSERT. Referenced by _populateModify(), event_Apply(), and event_ModifyClicked(). Referenced by event_NewClicked(), and new_styleName(). Referenced by s_basedon(), s_followedby(), and s_styletype(). Referenced by _constructModifyDialog(), _constructModifyDialogContents(), _populateModify(), and modifyRunModal(). References _constructModifyDialog(), AP_Dialog_Styles::_createAbiPreviewFromGC(), AP_Dialog_Styles::_populateAbiPreview(), _populateModify(), abiDestroyWidget(), abiRunModalDialog(), abiSetupModalDialog(), BUTTON_MODIFY_CANCEL, BUTTON_MODIFY_OK, DELETEP, AP_Dialog_Styles::destroyAbiPreview(), event_Modify_Cancel(), event_Modify_OK(), XAP_App::getApp(), AP_Dialog_Styles::getFrame(), isNew(), m_gbasedOnStyles, m_gfollowedByStyles, m_gStyleType, m_pAbiPreviewWidget, m_wModifyDialog, m_wModifyDrawingArea, and XAP_App::newGraphics(). Referenced by event_ModifyClicked(), and event_NewClicked(). fill the properties vector with the values the given style. References gchar, getNewStyleName(), XAP_App::getStringSet(), XAP_StringSet::getValueUTF8(), m_newStyleName, XAP_Dialog::m_pApp, AP_Dialog_Styles::m_vecAllAttribs, m_wStyleNameEntry, messageBoxOK(), PP_addOrSetAttribute(), PT_NAME_ATTRIBUTE_NAME, and s.
Referenced by _populateModify(), event_ModifyFont(), event_ModifyLanguage(), event_ModifyNumbering(), event_ModifyParagraph(), event_ModifyTabs(), and event_RemoveProperty(). References _constructWindow(), AP_Dialog_Styles::_createCharPreviewFromGC(), AP_Dialog_Styles::_createParaPreviewFromGC(), _populateWindowData(), abiDestroyWidget(), abiRunModalDialog(), abiSetupModalDialog(), DELETEP, event_Apply(), event_Close(), XAP_App::getApp(), XAP_Frame::getCurrentView(), AP_Dialog_Styles::getDoc(), AP_Dialog_Styles::getView(), m_pCharPreviewWidget, m_pParaPreviewWidget, m_tvStyles, m_wCharPreviewArea, m_windowMain, m_wParaPreviewArea, XAP_App::newGraphics(), s_charPreview_draw(), s_paraPreview_draw(), s_tvStyles_selection_changed(), AP_Dialog_Styles::setDoc(), AP_Dialog_Styles::setFrame(), AP_Dialog_Styles::setView(), and UT_ASSERT. References m_lbAttributes, m_wLabDescription, and UT_ASSERT. Referenced by event_basedOn(), and getBasedonName(). Referenced by AP_UnixDialog_Styles(), isModifySignalBlocked(), and setModifySignalBlocked(). Referenced by isNew(), and setIsNew(). Referenced by _connectSignals(), _constructWindow(), and AP_UnixDialog_Styles(). Referenced by _connectSignals(), and _constructWindow(). Referenced by event_followedBy(), and getFollowedbyName(). Referenced by _populateModify(), and modifyRunModal(). Referenced by _constructWindow(), AP_UnixDialog_Styles(), setDescription(), and setModifyDescription(). Referenced by _populateCList(), and AP_UnixDialog_Styles(). Referenced by getNewStyleName(), and new_styleName(). Referenced by AP_UnixDialog_Styles(), modifyRunModal(), and ~AP_UnixDialog_Styles(). Referenced by AP_UnixDialog_Styles(), runModal(), and ~AP_UnixDialog_Styles(). Referenced by event_DeleteClicked(), event_SelectionChanged(), and getCurrentStyle(). Referenced by _populateCList(), event_DeleteClicked(), event_ModifyClicked(), and event_NewClicked(). Referenced by event_styleType(), and getStyleType(). Referenced by _constructWindow(), _populateCList(), AP_UnixDialog_Styles(), event_DeleteClicked(), getCurrentStyle(), and runModal(). Referenced by _constructModifyDialogContents(), _populateModify(), and AP_UnixDialog_Styles(). Referenced by _connectModifySignals(), _constructModifyDialogContents(), _populateModify(), AP_UnixDialog_Styles(), and event_basedOn(). Referenced by _constructWindow(), AP_UnixDialog_Styles(), and runModal(). Referenced by _connectModifySignals(), and _constructModifyDialogContents(). Referenced by _constructModifyDialogContents(), and rebuildDeleteProps(). Referenced by _constructModifyDialogContents(), _populateModify(), and event_RemoveProperty(). Referenced by _connectModifySignals(), _constructModifyDialogContents(), _populateModify(), AP_UnixDialog_Styles(), and event_followedBy(). Referenced by _connectModifySignals(), _constructModifyDialogContents(), and AP_UnixDialog_Styles(). Referenced by _populateCList(), and event_ListClicked(). Referenced by AP_UnixDialog_Styles(), event_ModifyClicked(), and runModal(). Referenced by _constructModifyDialogContents(), AP_UnixDialog_Styles(), and setModifyDescription(). Referenced by _constructGnomeModifyButtons(), and AP_UnixDialog_Styles(). Referenced by _constructGnomeModifyButtons(), _constructModifyDialog(), AP_UnixDialog_Styles(), event_ModifyFont(), event_ModifyLanguage(), event_ModifyNumbering(), event_ModifyParagraph(), event_ModifyTabs(), and modifyRunModal(). Referenced by _connectModifySignals(), _constructModifyDialogContents(), AP_UnixDialog_Styles(), and modifyRunModal(). Referenced by _connectModifySignals(), _constructModifyDialogContents(), _populateModify(), AP_UnixDialog_Styles(), event_Modify_OK(), and new_styleName(). Referenced by _connectModifySignals(), _constructModifyDialogContents(), _populateModify(), AP_UnixDialog_Styles(), and event_styleType().